Does the waffle look like a peeking bear? When I cut the waffle in half, the idea of giving it a face came to my mind. I must say that I overslept today and my mind seemed quite foggy when I started making this bento. Eggo waffle and MorningStar Farms grillers veggie burger cut in half. Mild cheddar cheese ears ( I used a circle cutter and then cut the cheese into half), mozzarella cheese eyes with nori pupils and a raisin nose. Seedless red grapes with a bear pick. Crinkle cut carrots with a container of ranch for dipping. I love this lunch, cute and relatively simple! So cute! 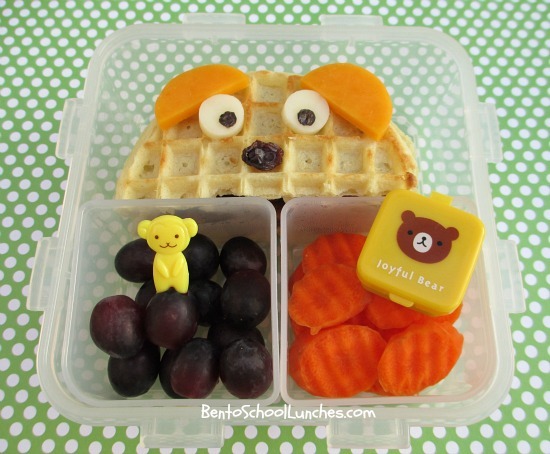 Brilliant idea to use the waffle as the bear's face!